Audioboom / Episode #37 feat. Sonny Sandoval of P.O.D. Ah, nu-metal. The red-headed brother of heavy metal that's cool when it produces some amazingly talented bands (Linkin Park, KoЯn, Limp Bizkit, Evanescence) and shunned away from the public eye when some utter crap makes its way through the mould. But one band from the genre who has still managed to stand the test of time after all these years is none other than Payable on Death aka P.O.D. who are making their return to Australia this month and playing tracks from their internationally recognised 2001 album Satellite (plus a whole heap more). 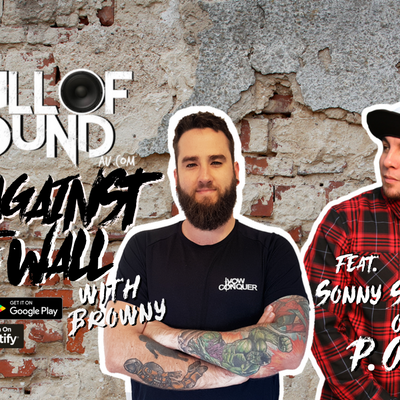 Frontman Sonny Sandoval is this week's guest on Wall of Sound: Up Against The Wall Episode 37 and we're going back in time to discuss the band's heightened popularity following the song they wrote and recorded for The Matrix Reloaded soundtrack, 'Sleeping Awake'. A song which almost NEVER saw the light of day because The Wachowskis were convinced they had firstly, seen the movie illegally before anyone else and secondly, were giving away too much of the plot prior to it's release. Podcast host Browny also draws attention to the band's hard-hitting teenager focused track 'Youth of the Nation' which took inspiration not only from the infamous Columbine High School Massacre but a local San Diego School shooting which took place a couple blocks away from where they were recording their album. Sonny reflects on the song and discusses whether the band would record a similar single to address the still-current lack of gun control and/or laws which haven't been changed despite the ongoing tragedies. Plus there's plenty of throwbacks from your favourite nu-metal acts like Limp Bizkit, Saliva, Papa Roach, Alien Ant Farm, Flyleaf and System of a Down. Lajon Witherspoon from Sevendust stops by for a quick chat about their new album All I See Is War and Troy from the Gold Coast takes over the podcast for 'Two Songs that Changed Me'.